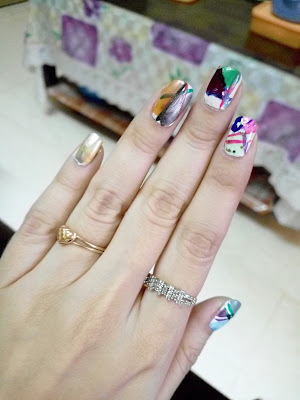 Today I am not going to talk about the things that we use in nail arts or how a nail art is done, but something that is to be applicable to one and all. I would like to share a story with you all. Thing that I and everyone of you have experienced but ignore it or don't notice it at all. 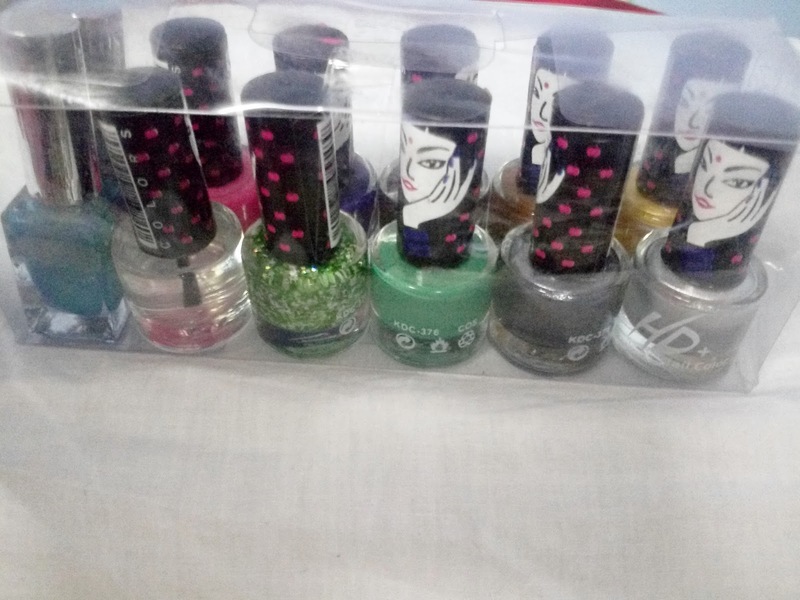 Yesterday, it was my birthday and as I am a nail art freak, my sister gifted me this beautiful set of nail paints ( as you can see in the picture). Aren't the colours are so pretty?!! I wanted to try them all. Try them at once. So the next morning when I woke up, I had the previous nail art on an I was too lazy to remove it. It was a dilemma!! So what I did was this, try them all at once. Crazy it is, I know (the picture says it all). Then I looked at it, a thought came into my mind that, this looks so messy and bad. It is not even A nail art. Not even an applicable of proper nail paint, but there is one thing to consider and that it I had fun doing this, looking at it make me smile and all I learned is, sometimes we should do this out of our way, maybe that won't look good for others but it will look the best for you. It may not be the best thing that we have done but craziest and something to cherish. I don't say that don't do your work instead I would say do your work with the same dedication as always but have some time for yourself, for the craziness, for the child in you. Remember, one thing that can make you happy, is you and your space. I hope that this wasn't something redundant or irrelavent for you. Sorry if I had wasted your time with no intentions of doing so. I hope you have a great life. Enjoy the little things and do good fot people. Now coming tot the nail art stuffs, please stay tuned for a nail art coming soon. Till then, keep following.